McCormack Plastic Surgery becomes the first Reno-area cosmetic practice to house an onsite outpatient facility accredited by the American Association for Accreditation of Ambulatory Surgery Facilities, Inc.
Reno, NV — At McCormack Plastic Surgery, board-certified Reno plastic surgeon Tiffany McCormack, MD and her team have always held patient safety in the highest regard. As a testament to this devotion, the cosmetic surgery practice recently announced the opening of its new onsite outpatient facility accredited by the American Association for Accreditation of Ambulatory Surgery Facilities, Inc. (AAAASF). The onsite outpatient facility’s equipment and overall environment must meet and uphold strict safety standards of excellence set by AAAASF. Operating rooms in the office-based outpatient facility must adhere to the same safety standards and regulations upheld in hospitals. For every procedure performed in the onsite outpatient facility, surgeons must have hospital operating privileges. An anesthesia professional must be on location to administer deeper levels of anesthesia when necessary. Peer reviews must be conducted and surgical data must be collected regularly. All operations must follow federal laws and regulations. “Housing an AAAASF-accredited onsite outpatient facility at McCormack Plastic Surgery is somewhat of a unique luxury as it enables our patients to receive the same safety and quality of surgical care they would in a hospital setting, all in the comfort and privacy of our own office,” notes a recent blog entry on the Reno plastic surgeon’s website. Additional highlights of Dr. McCormack’s onsite outpatient facility include an expansive array of state-of-the-art surgical equipment, an inconspicuous entrance for maximum privacy, an exceptional degree of individualized attention, and more. 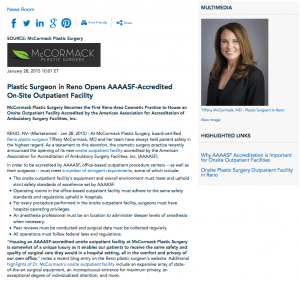 Ultimately, Dr. McCormack says she is proud to offer cosmetic and reconstructive surgery patients the convenience and confidentiality afforded by an onsite outpatient facility, and she plans to ensure her center continues exceeding AAAASF standards of excellence so as to always provide the safest, most effective surgical care possible. Certified by the American Board of Plastic Surgery, Dr. McCormack completed her training in plastic surgery at the esteemed Stanford University Medical Center. At her practice, she offers an inclusive span of cosmetic treatments and procedures ranging from breast augmentation and abdominoplasty to mommy makeover and injectable fillers. Dr. McCormack is a Fellow of the American College of Surgeons, as well as an active member of the American Society of Plastic Surgeons and the American Society for Aesthetic Plastic Surgery. She is available for interview upon request.